Some days you wake up and think, “I need a good scare.” Luckily, you have countless options at your finger tips. To help you sift through some of those options, I present you my curated list of a few favorites. 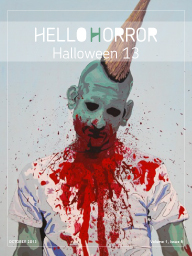 East of the Web has a nice catalog of horror short stories. You could get lost for hours. Nightmare Magazine offers a fine selection of short horror, updated often. Hello Horror has many great issues under its belt. my short story, “Remembering Tommy” was included a while back. Werewolf News offers a wide array of, well, news about werewolves. If you love lycanthropes, check it out. Plenty of new werewolf news to keep things fresh. The Missing Reel offers movie news, reviews, clips, and access to short films. Refreshed with horror often. Horror News has a magnificent collection of news from all over the world of horror and includes a short film area. ScoopWhoop did the hard work here and compiled 25 worth watching, but when you’ve watch the, you’ve watched them. Fini.